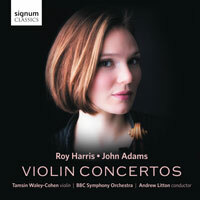 ROY HARRIS (1898-1979): Violin Concerto, JOHN ADAMS (b.1947): Violin Concerto. Description: Harris’ concerto (1949) is a 27-minute, single-movement work in which the soloist plays constant dance-like variations over orchestral chorales and is in his best inspiring, optimistic mode. Only one other recording on disc too - the 1985 Louisville Orchestra one issued in 2003 by First Edition. This is the fourth CD recording now of the 1993 Adams which is far more than mere minimalism and which should appeal to more traditionalist collectors. Tamsin Walley-Cohen (violin), BBC Symphony Orchestra; Andrew Litton.